Building pros will tell you there are two types of concrete...concrete that's cracked and concrete that's about to crack. It's a fact of life. Babies cry, concrete cracks. What can you do? In search of the answer, we were lucky enough to borrow James Witt's crew just before the holidays. 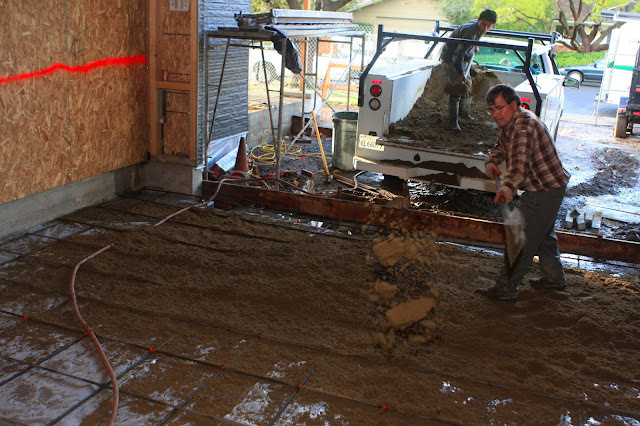 James is one of the top home builders in Palo Alto and his crew had some downtime so we snapped them up to put in our garage floor and porches. 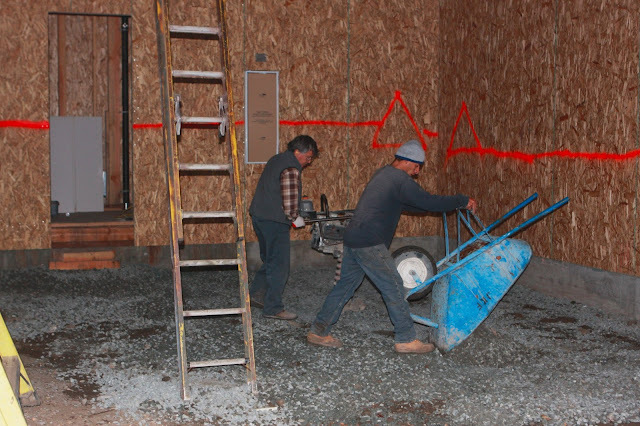 These guys have been building high-end homes for over 40 years, so if anyone knows how to keep you from crying over cracks in your concrete, it's these guys. Step 1: Fill in a layer of base rock. This helps water drain away from the slab and keeps it from getting waterlogged. Compact the base rock so that it doesn't shift from settling. Step 2: Cover with a layer of plastic to act as a vapor barrier. 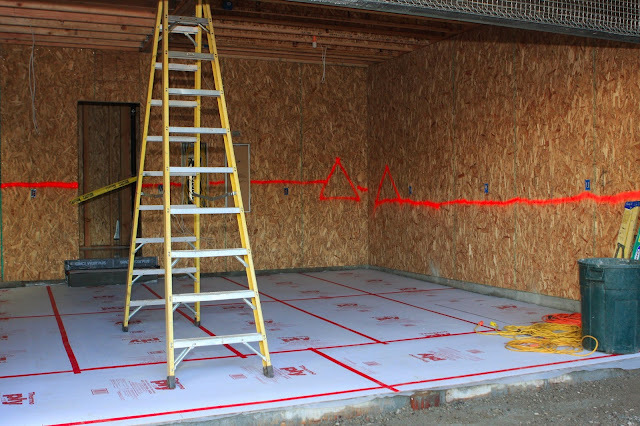 The city of Palo Alto doesn't require a vapor barrier for garages (only for living spaces) but it's a preventative step that doesn't cost much and helps keep ground water from moving up into the concrete. Step 3: Cover with sand. This helps pull moisture away from the concrete as it's drying. Water is the enemy of concrete, so you want to do anything you can to move and keep water away from the slab. Step 4: Build form and add reinforcement bars (rebar). We were waiting for the sand to arrive so the crew went ahead and put the rebar in first. 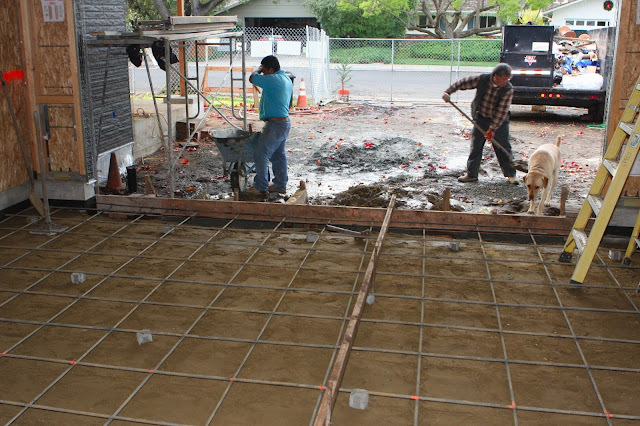 The trick with the rebar is that in order to work, it needs to rest in the middle of the slab, not at the bottom, so you want to anchor it off the ground in a way where it'll stay put when the concrete is poured. The rebar keeps the concrete from shifting and cracking. 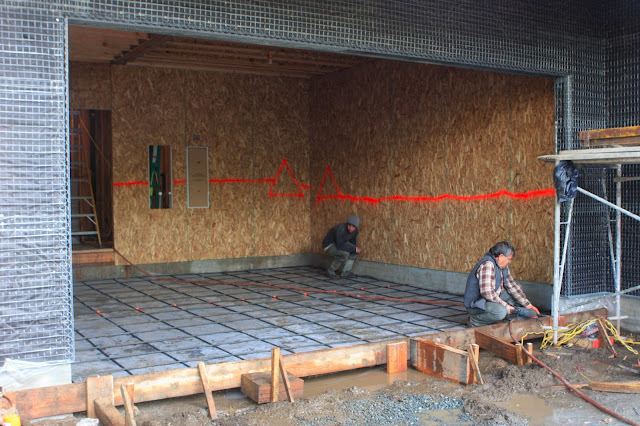 The form should have a slight slope (a couple of inches per 20 ft) so that water runs away from the area instead of pooling on your garage floor. The slope should be steeper if you have a sink or water heater in the garage. 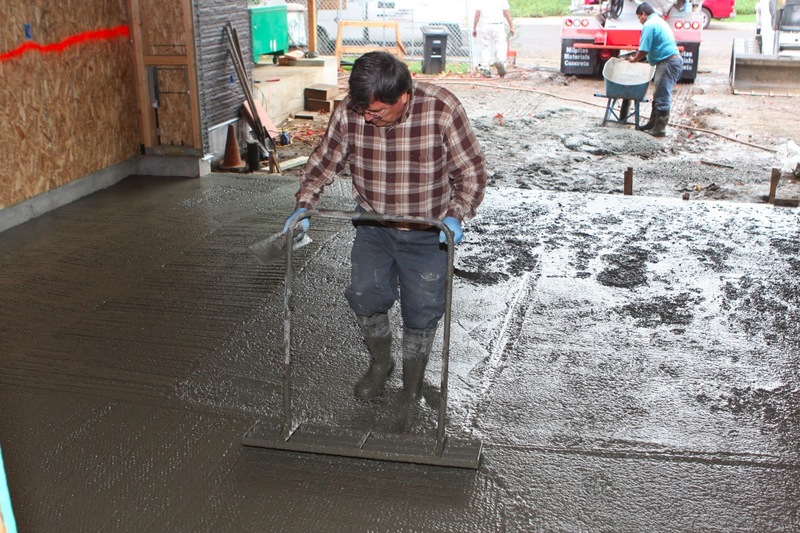 Step 5: Pour and level the concrete. A standard garage floor is typically 4 inches thick. James's crew always makes their garage floors 6 inches thick in order to handle more load--this is one of those invisible upgrades that the best builders do in order to improve the quality of the house. 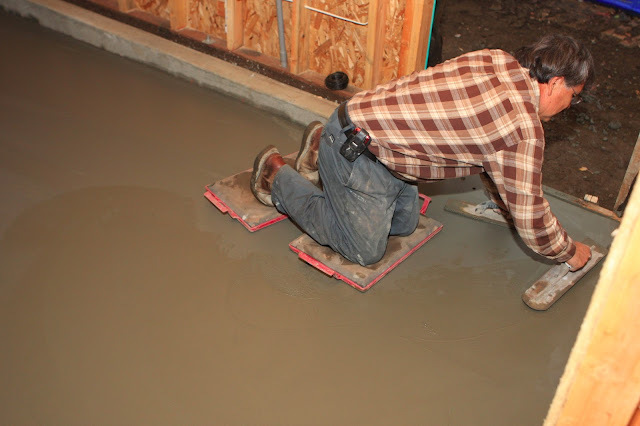 They also allow the floor to float instead of drilling it into the foundation (the porches, on the other hand are attached to the foundation). Floating the slab allows more movement...just like wood, concrete shrinks and expands as it dries and as the temperature and humidity change. Step 6: As the concrete hardens apply a smooth finish. Note: If you want to imprint your hand/paw print in the concrete, you'll need to show up before this stage. Thomas and Astro make another futile attempt to leave their mark on our house (Cisco and I put our prints on the rat slab). 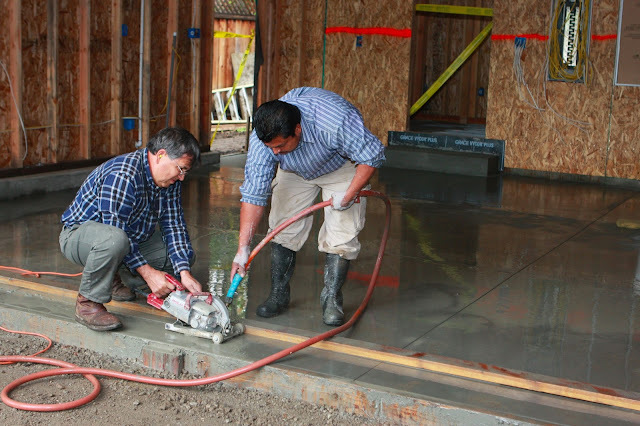 Step 7: The next day (before the concrete completely hardens), spray down water while cutting in thin grooves every 6.5 feet. These are called expansion joints and provide crack resistance. Concrete shrinks as it dries, so these joints absorb the stress caused by this movement and any subsequent expansion. Since concrete inherently wants to crack, by cutting in these small grooves you encourage it to crack at these points. Step 8: Leave the new slab alone and let it dry. Then cover and protect it during through the rest of the construction. That's all folks! They make it look easy, don't they? Special thanks go out to Daniel and the rest of the expert crew for our fabulous garage floor! One of the features of our new house that I'm most looking forward to is radiant heat. I'm writing this post from our house in Mountain View which feels like an igloo. Our furnace is running full blast right now and I'm wrapped up on the couch in sweats, a turtleneck, wooly slippers plus an extra blanket and furry dog on my lap trying to stay warm. 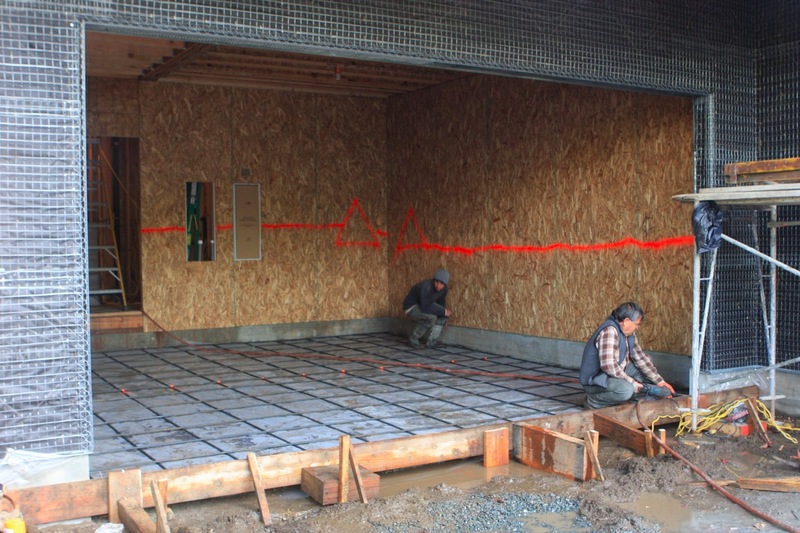 We are working with the highly recommended team at Alternative Energy to install our radiant floor system. 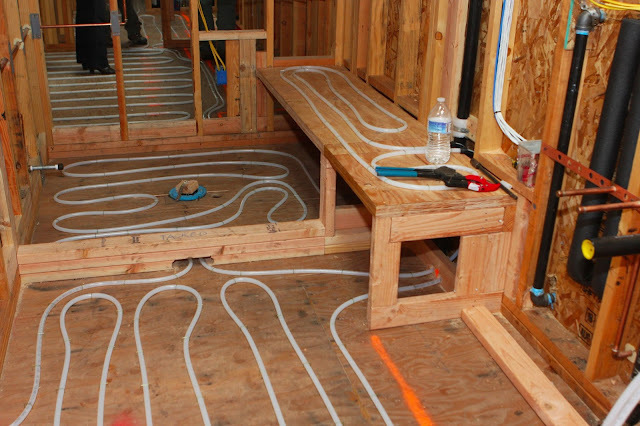 The hydronic (liquid) system will circulate heated water from a boiler through a series of plastic tubes embedded in the floor. We are also using this same boiler to supply our hot water throughout the house, except for two small tankless water heaters that will supply instant hot water to the upstairs bathrooms. The tubes are rated for a 12" reach but tighter layouts result in more even heat. Ours were spaced at 6-9". Comfortable: No more cold feet! 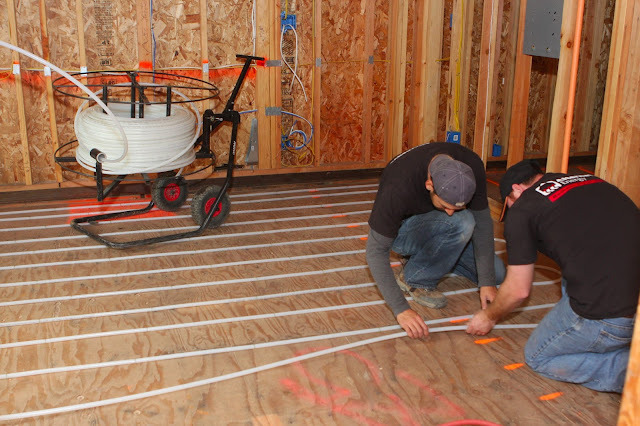 Radiant heat creates a more even heat throughout the house that is warmest at the floor and furniture level (where you need it) and cooler towards the ceiling (forced air does the exact opposite). Since our body temperature is warmest at our head and circulation is poorest at our feet, people are generally more comfortable in a room that is warm at the floor and cooler at head level. Another added benefit is that the air doesn't get dry like with forced air systems. The tubes all connect to a water boiler located under the stairs. Pretty sure this will be the hot spot where the dogs camp out in the winter. Clean: Unlike forced air heating which blows heat--along with dust, odor and germs--around the house, radiant heat doesn't use ducts and creates only gentle room air circulation. The flip side of this is that without any ducts to the outside, the air can get stuffy so you'll want to occasionally open your windows or run a whole house fan to allow fresh air in. Radiant heat is really good for allergy sufferers and pet owners since it doesn't spew allergens and dust bunnies around the house. Customization: It's easier to zone your house with radiant heat, allowing various areas to be controlled by their own thermostat. We have the kitchen and family room on one zone that can be kept warmer than the bedrooms since we like sleeping at cooler temperatures. We also put the rooms we won't use as often (the office, living and guest room) on their own zones that can be kept off. The bathrooms each have their own zone and can be programmed to warm up before we wake up...woohoo, no more freezing cold tile first thing in the morning. 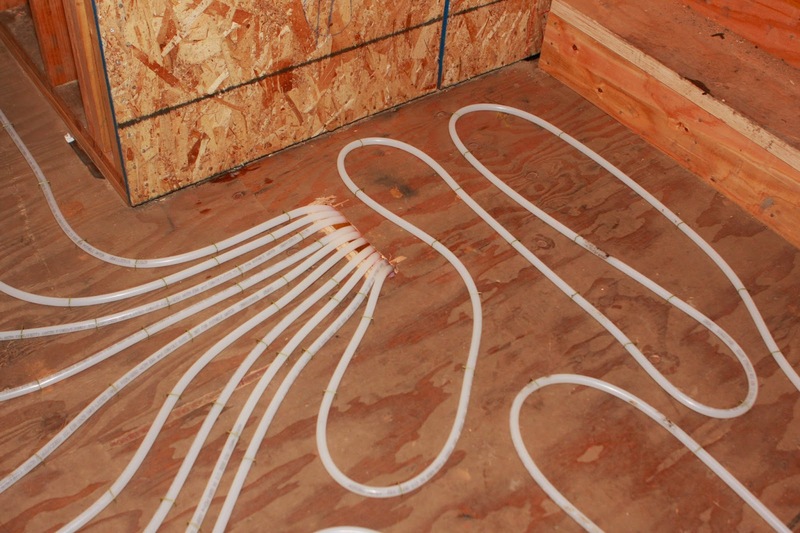 You can also run the tubing in tighter patterns in rooms that you will use a lot and wider apart in the areas you don't need to be as warm. For fellow showeraholics...don't forget to run the tubes in the shower AND on the bench! Quiet & Durable: Radiant heat is quiet since there are no furnaces, blowers or pinging radiators. 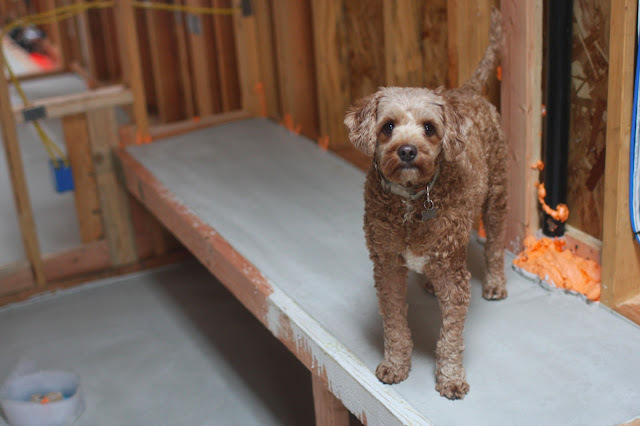 The plastic tubing is embedded in concrete so it is virtually indestructible as long as you avoid nailing into your floors. 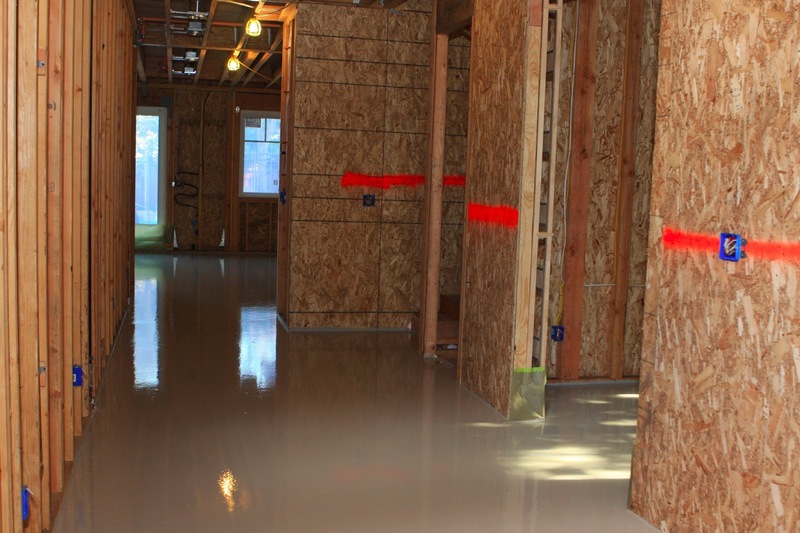 Our floors will include engineered hardwood, carpet and tile, all of which will be glued down on top of the concrete. 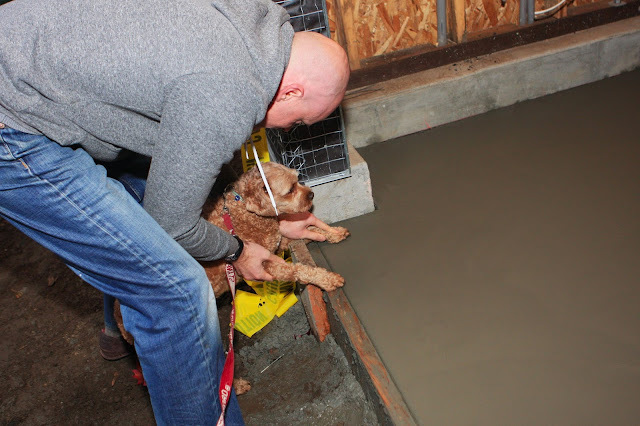 Because our system is built into a thin layer of concrete (~1.5" thick) above the subfloor, it's much easier to repair than a system built into a thick slab foundation. It also avoids damage caused by settling. Note: You want to be sure to have your cabinets planned out ahead so that you can avoid laying down tubes beneath them. After the tubes are pressure tested for leaks, they are set in "gypcrete"-- a thin layer of concrete. The orange square marks where one of the legs from our island will be nailed down. Efficient: Since there are no drafts with radiant heat, the average room temperatures can be decreased by 3 degrees to 6 degrees Fahrenheit. Cold feet make your whole body feel cold, whereas warm feet does the opposite. Because the high surface temperature of the floor warms your feet, I'm told that most homeowners with radiant heat are comfortable with a lower thermostat setting around 65 degrees. We generally keep our forced air system at about 67 degrees and I'm always freezing in our house (high ceilings don't help matters). The prospect of have toasty bare feet in the winter sounds like a dream to me. The main disadvantage of a radiant heat is that it's quite a bit more expensive than traditional forced air systems (although it has a lower operating cost). I don't have the final amounts yet, but I suspect it'll be approximately 20K more than a forced air system. Also, because there are no ducts, if you want to put in an air conditioning system, you still have to pay to do the ductwork (which in our case would've cost another 10K). With our heavily shaded lot, we decided we probably won't need air conditioning. However, we did hedge our bets and spent $400 to run a condenser line up to the roof in case global warming changes our mind down the road (this type of work is much cheaper now when the walls are open). Because we have open attic space, we can always add the ductwork later. There are also radiant cooling options that work off of the same system but again, we didn't think we'd use it enough to warrant an additional 10-20K investment. In my opinion, if you're building a new custom home, radiant heat is one the best upgrades to indulge in. It requires a little extra time and advanced planning (your architect will need to put it in your building plans) but your toasty paws will be thanking you for years to come. Even the haters are gonna love bath time with our new heated shower floors & bench.